In recent weeks I have seen two recently overhauled coaches and one part way through an overhaul. These photos have come from my camcorder, so aren’t the best – but worth showing. Only small photos here, but click them to see larger versions, which are also in my gallery. This entry was posted in Uncategorized on November 24, 2015 by Sharpo. I prefer to film a train than take photos, which means there aren’t many photos appearing these days. If there is time and the loco is in a suitable location, then I can take a photo with the camcorder, then copy it via wifi to my mobile phone and upload it to my blog. It takes several minutes to copy it across, then several more minutes to upload the photo and resize it. After that, create a blog posting. With more practise I should get quicker, but it’s fun to “mess about” at this sort of thing, even if I don’t add many photos when out and about. The previous posting of 1450 shows it can be done. This entry was posted in Sharpo's World Photo Updates on November 14, 2015 by Sharpo. This entry was posted in Severn Valley Railway on November 14, 2015 by Sharpo. It ran as light engine yesterday, but today it had a load of 6 coaches. Before I arrived it had hauled the stock from Kidderminster to Bewdley, then is seen returning in the photo. I have also uploaded a video, from which the images were taken. The video shows 1501 departing before 7802 can run into the station. It was VERY WINDY, so excuse the wind noise!!! Click photo to see larger image. This entry was posted in Severn Valley Railway, Sharpo's World video updates on November 8, 2015 by Sharpo. It was on a test run from Bridgnorth to Kidderminster & return today. The photo is a frame taken from the video, click photo to see a larger image. 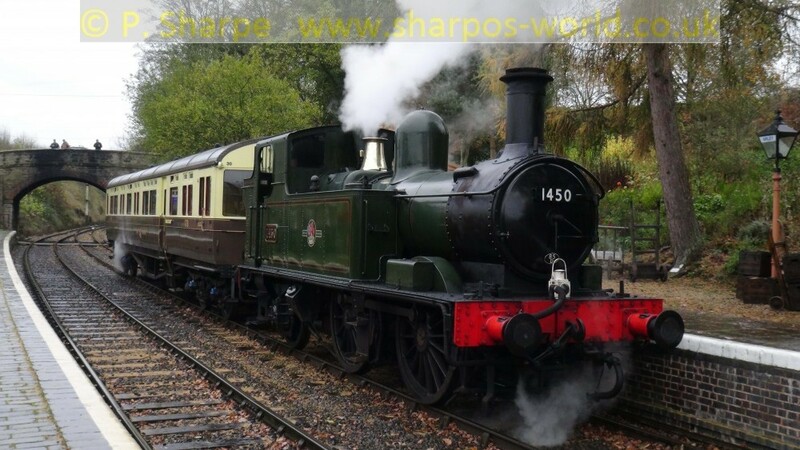 This entry was posted in Severn Valley Railway, Sharpo's World video updates on November 7, 2015 by Sharpo.